For relief of lameness and other symptoms associated with laminitis, quarter cracks, navicular syndrome, contracted heels and other hoof problems. 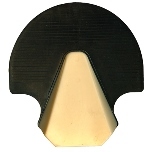 Each pad is a blank that the farrier or veterinarian shapes to meet the particular need of each individual hoof. Spreads heels by increasing frog pressure. Pad is applied with 1/2 shoe – instructions included.